Program variables can be used in main program. The main program is evaluated at level 0. There are 9 variable levels to evaluate variables. the new variable will be evaluated at level N+1. A is evaluated at level 1. B is evaluated at level 2. C and D are evaluated at level 3. E is simply replaced by 10. 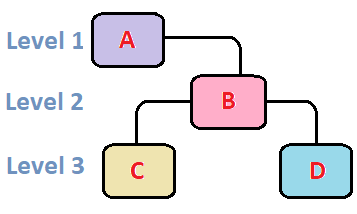 Area (Region) 3 is used to evaluate C.
is deleted in Area 3.
area 3 is deleted to allocate space for evaluation of D.